When you adopt a turtle, he'll appreciate it if you first find out everything you can about keeping him comfortable and healthy. For instance, turtles in the wild rely on consistent access to sunlight for heat and for the ultraviolet "B" rays that provide him with vitamin D3. Proper lighting can be a matter of life and death for your turtle, so you'll want to ensure that you use the right kind of bulbs. Browse the reptile section of any pet store and you'll find a selection of choices of UV lights for your turtle. Even if the packaging says "full-spectrum," you should read on to ensure you're getting a light bulb that emits UVB as well as UVA light. 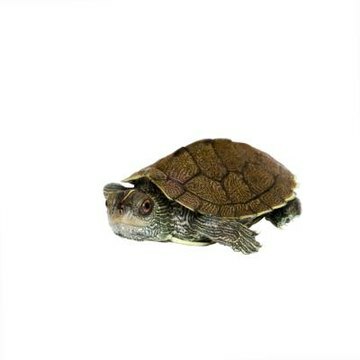 Look specifically for the amount of UVB concentration, since that is the crucial ultraviolet element your turtle needs. He requires a bulb that puts out at least 3 percent concentration, but not more than 8 percent. If you're comparing tropical UVB lights with desert UVB lights, opt for tropical, as they are made for use with aquatic turtles and aren't as intense as the desert bulbs. When you're shopping for light bulbs vs. heat bulbs, you'll want the fluorescent type. Since your turtle is a coldblooded creature who can't produce body heat, he'll need a light to bask under. Yes, all types of light bulbs emit heat, but your turtle will bask best under an incandescent bulb. They work better for heating purposes than for providing UVB light. Place one at least 12 inches above a large flat rock for your turtle to laze upon while he's enjoying the heat. In her 2009 book "Turtles," Marie Devers advises the bulb be placed up far enough that your turtle can't reach it and get burned. If you don't have the terrarium room for more than one type of lamp, you can always go with a special type of bulb that provides UVB light and heat all in one. Get self-ballasted mercury vapor lamps if you want to give your turtle all the heat and light he needs using just one bulb. They're useful for keeping things simple, although they're more expensive than other light bulbs for your turtle. They also put out a lot of heat, so these types of bulbs aren't recommended for turtle habitats that are particularly small. In the natural world, sunlight isn't constant. The sun rises and sets, and your turtle's inner clock goes by that cycle. That means providing your turtle with 12 to 14 hours of light every day but turning the light off during the other 10 to 12 hours. Putting the lights on a timer is useful because you won't have to worry about forgetting to turn them off and on. If you want to observe your turtle even when his light bulb is off, you can get a third lamp for his habitat that holds a red or black light to allow you to see him without keeping him awake. These bulbs put out a bit of heat even though they don't emit a bright light. That means they can be useful for maintaining your turtle's terrarium temperature during the night, but they still should be kept a safe distance from your turtle -- 12 inches or more, but at least out of his reach.